The purpose of this guide is to identify the most common infrared-transmitting materials, pointing out key properties and their typical manufacturing and optical coating options. The information provided within this article is for reference purposes only. The optical materials selected for an optical system depend upon the application, the required system performance and the environment in which the system is to perform; thus the materials’ optical, mechanical, thermal and thermo-optic properties must be taken into account. There are three major bands that are worked with when optical systems are used within the Earth’s atmosphere. They are the short-wave infrared (SWIR) or near-infrared (NIR), which covers from 0.75 to 3 μm; the mid-wave (MW) infrared, which covers from 3 to 5 μm; and the long-wave infrared, which covers 8 to 14 μm. The areas in between these bands cannot be used due to absorption by various molecules in the Earth’s atmosphere. However, these in-between bands are usable if the system is at high altitude or in space. 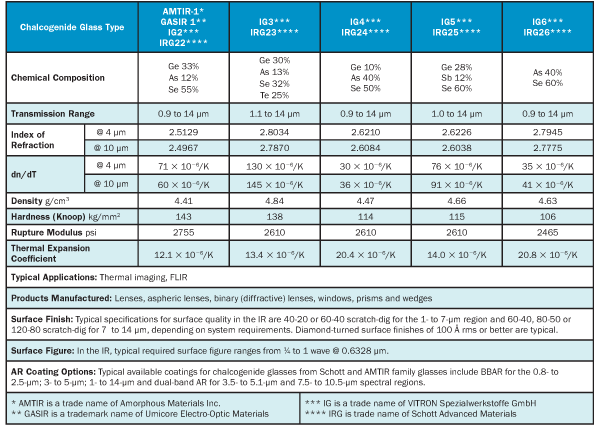 Materials added to this updated guide include chalcogenide glasses; although available for many years, they have come of age in the optics industry due to their unique material properties. Other materials added to this guide are sapphire, aluminum, copper, electroless-nickel plated metal and copper nickel alloy. Optical coatings for infrared materials have evolved over time with the availability of advanced technologies, automation, and processes using plasma-enhanced chemical vapor deposition, ion assist deposition with electron beam sputtering and resistance sources. With the development of new chalcogenide materials and increased demands for lens systems that perform over multispectral bands from the visible (VIS) to the LWIR, the demand for new coating designs and processes has increased for both commercial and defense applications. Examples of current and new coatings for IR materials are mentioned in the updated guide, along with their environmental durability tests. There is a glossary at the end of the article in case a definition is required. Polishes of 20-10 scratch-dig are mostly specified for UV and VIS applications. Typical specifications for surface quality in the IR are a 40-20 scratch-dig in the NIR spectral region and 60-40 scratch-dig for the MW area. Surface figure of 1/10 to 1/4 wave @ 0.6328 μm are specified mostly on lenses for UV and VIS use. In the IR, typical surface figure ranges from 1/2 to 2 waves @ 0.6328 μm. Typical available coatings for BaF2 include BBAR for 0.8 μm to 2.5 μm, 3 μm to 5 μm, or 1 μm to 5 μm, and dual-band AR for the 3.5- to 5.1-μm and 7.5- to 10.5-μm spectral regions. Typical specifications for surface quality in the IR are a 40-20 scratch-dig in the NIR spectral region and 60-40 scratch-dig for the MW spectral region, and 60-40, 80-50 or 120-80 scratch-dig above 7 μm. CdTe can be AR-coated for various wavelengths or wavelength ranges between 1 and 25 μm. Polishes of 20-10 scratch-dig are mostly specified for use in UV and VIS applications. Typical specifications in the infrared are 40-20 scratch-dig for the NIR spectral region and 60-40 scratch-dig for the MW spectral region. In the UV and VIS spectral regions, specified surface figure ranges from 1/10 to 1/4 wave @ 0.6328 μm. In the IR, typical required surface figure ranges from 1/4 to 2 waves @ 0.6328 μm. Available coatings include BBAR for the 0.8 to 2.5, 3 to 5, or 1 to 5 μm, dual-band AR for MWIR and LWIR and triple-band for NIR and MWIR spectral regions. Other options are also available. • Optical-grade cesium bromide transmits from the UV to the far-IR; one of the widest transmission bands of the IR materials. • It is water-soluble, requiring protection from water moisture and humidity: accomplished by using moisture-protection AR coatings or by ensuring uncoated part is in a water-/humidity-free environment. Transmission is above 80 percent from 0.35 to 32 μm. Typical specifications for surface quality in the IR are 60-40, 80-50 or 120-80 scratch-dig. In the IR, the typical surface figure specified ranges from 1/10 to 1/40 wave @ 10.6 μm. Moisture-protection AR and BBAR coatings are available for various wavelengths or wavelength ranges within CsBr’s transmission range. • Optical-grade cesium iodide transmits from the UV to the far-infrared; it has the widest transmission band of all the readily available IR materials. Transmission is above 80 percent from 0.42 to 40 μm. Moisture-protection AR and BBAR coatings are available for various wavelengths or wavelength ranges within CsI’s transmission range. • The IR optical materials known as the chalcogenides, of which the various AMTIR glasses are a part, are optimized for pairing with other IR materials in optical designs. • The low dn/dT of the chalcogenides makes athermalization of a lens system much simpler by the removing required mechanical compensation complexity for the athermalization of optics with higher dn/dT’s. • The chalcogenide series of glasses can be processed by generating, polishing, diamond turning, magnetorheological finishing or molding. • Generally used in the MW, LW and sometimes the NIR. • Nearly as dense as Ge and has a lower index of refraction, making it a good option for color correction with the use of Ge in an optical system. • Top use temperature is 300 °C. • Performs especially well in the 8- to 12-μm area, where its absorption and dispersion are the lowest. Note: Transmission values are typical for reference and are based on samples 6 to 6.4 mm in thickness. Source: Amorphous Materials Inc., SCHOTT North America, Inc. – Advanced Optics and Vitron Spezialwerkstoffe GmbH. • IR-grade fused silica is used in NIR systems, usually along with other materials such as CaF2. • It has high homogeneity and good transmission in the VIS and NIR spectral regions. • Due to the material’s inherently hard SiO2 amorphous structure, fused silica is not diamond turnable, making it much more difficult and costly to fabricate finished aspheric surfaces. Typical specifications for surface quality in the NIR regions are 40-20 scratch-dig. In the VIS and NIR, typical surface figure ranges from 1/10 to 1 wave @ 0.6328 μm. 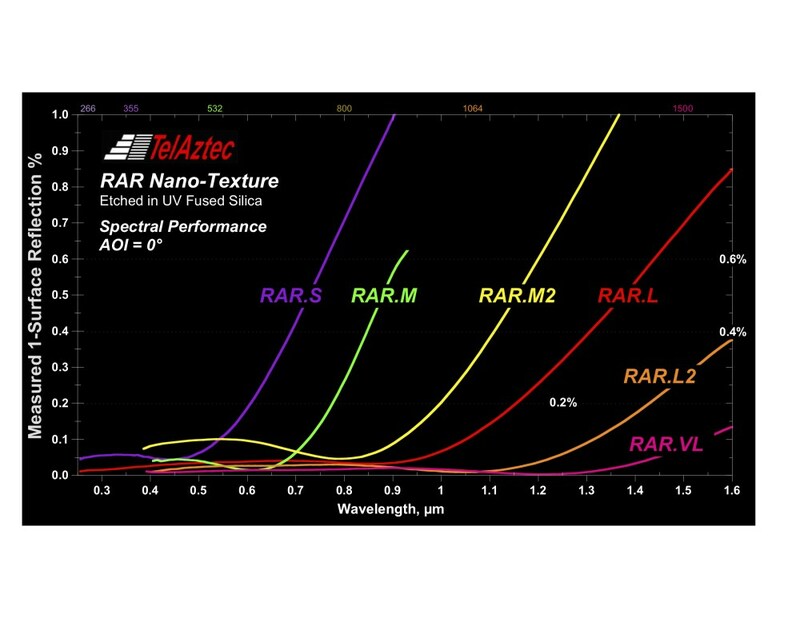 Typical available NIR coatings are BBAR for 0.8 to 2.5 μm and AR for 1.064 μm. Other coatings for UV, VIS and NIR applications are also available. • Optical-grade gallium arsenide is IR-transmitting and semi-insulating. Typical specifications for surface quality in the IR are 40-20 or 60-40 scratch-dig in the 2- to 7-μm region and 60-40, 80-50 or 120-80 scratch-dig for 7 to 15 μm. In the IR, typical surface figure ranges from 1/2 to 2 waves @ 0.6328 μm. Typical available coatings include BBAR in the 3- to 5-μm and 8- to 12-μm regions. Other specialized bands are also possible within the 2- to 15-μm region. • Germanium has the highest index of refraction of any commonly used IR-transmitting material. • It is very popular for systems operating in the 3- to 5-μm or 8- to 12-μm spectral regions. • Its high index of refraction makes it desirable for the design of lenses that otherwise might not be possible. • Germanium is a diamond-turnable material, so it is possible to incorporate aspheric and diffractive surfaces cost-effectively, which can in turn reduce the number of lens elements required in an assembly. • Germanium naturally blocks UV and VIS light, as well as IR up to about 2 μm. • Germanium has a large thermo-optic coefficient (dn/dT), causing large focus shifts with temperature that can make athermalization of an optical system difficult. • Germanium has nearly the highest density of the IR-transmitting materials, which must be taken into account when designing weight-restricted systems. • The material is also susceptible to thermal runaway; the hotter it gets, the more its absorption increases. • Pronounced transmission degradation starts at about 100 °C, and rapid degradation begins between 200 and 300 °C, resulting in possible catastrophic failure of the optic. • Germanium is generally less expensive than ZnSe and Cleartran. Typical specifications for surface quality in the IR are 40-20 or 60-40 scratch-dig in the 2- to 7-μm spectral region and 60-40, 80-50 or 120-80 scratch-dig for 7 to 14 μm. Diamond-turned surface finishes of 50 Å rms or better are typical. In the IR, the typical specified surface figure ranges from 1/4 to 2 waves @ 0.6328 μm. Typical available coatings include BBAR for the 3- to 5-μm, 8- to 14-μm and 3- to 14-μm spectral regions. Other application-specialized bands are also possible between 2 and 14 μm. Ge can also be diamondlike carbon coated in the 3- to 5-μm or 8- to 12-μm regions. • Lithium fluoride has the lowest index of refraction of all the common IR materials. • It is slightly plastic, meaning that when it is mechanically stressed, it doesn’t come back to its original form. • It also has a relatively high thermal expansion coefficient and is the most expensive of the fluoride series of crystals. Typical specifications for surface quality in the IR are 40-20 scratch-dig in the NIR and 60-40 or 80-50 scratch-dig for the MW area. In the IR, typical required surface figure ranges from 1/2 to 2 waves @ 0.6328 μm. LiF can be AR-coated for use in the IR, but often without much improvement in transmission due to its low index of refraction and already high transmission. • Magnesium fluoride is one of the lowest-index IR materials, second only to LiF. • Its birefringence should be taken into consideration before selection of this material in an optical design. • It is resistant to thermal and mechanical shock. • It is twice as hard as CaF2 but only half as hard as Ge. • It is significantly more expensive than CaF2 and BaF2, but usually not more expensive than LiF. Polishes of 10-5 or 20-10 scratch-dig are achieved at extra costs mainly for UV applications. Typical specifications for surface quality in the VIS and NIR regions are 40-20 and 60-40 scratch-dig in the MW range. In the UV and VIS, surface figure ranges from 1/10 to 1/2 wave @ 0.6328 μm. In the IR, typical required surface figure ranges from 1/2 to 2 waves @ 0.6328 μm. MgF2 can be AR-coated for use in the IR but often without much improvement in transmission due to its low index of refraction and already high transmission. The most common metals used for metal mirrors are aluminum, electroless-nickel and copper. • Is water-soluble, requiring protection from water moisture and humidity: accomplished by using moisture-protection AR coatings or by ensuring the uncoated part is in a water-/humidity-free environment. Moisture-protection AR and BBAR coatings are available for various wavelengths or wavelength ranges within KBr’s transmission range. • Transmits from the UV to the far-IR; one of the widest transmission bands of the IR materials. Typical specifications for surface quality in the IR region are 60-40, 80-50 or 120-80 scratch-dig. Moisture-protection AR and BBAR coatings are available for various wavelengths or wavelength ranges within KCl’s transmission range. • Sapphire is one of the hardest and most durable optical materials. 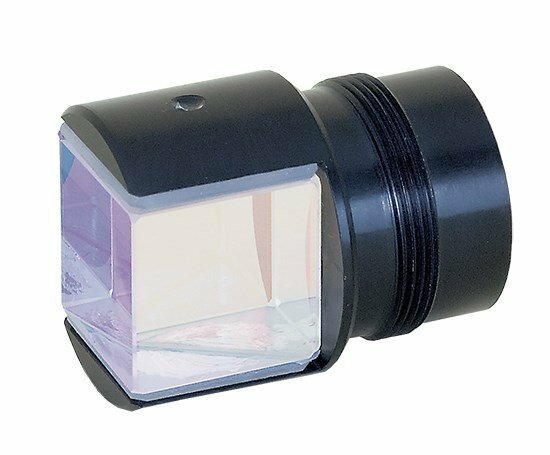 • Commonly used in IR optical systems, operating in the NIR and MW spectral bands. • Sapphire’s crystal structure has a rhombohedral shape and is highly anisotropic, meaning its optical and mechanical properties vary with the crystal’s orientation. • It is harder than most all-optical materials, with the exception of diamond. • Sapphire is not diamond turnable, thus making it more difficult and costly to generate and polish aspheric surfaces into it. Typical specifications for surface quality in the IR are 40-20 scratch-dig in the 1.2- to 3-μm region and 60-40 for 3 to 7 μm. In the IR, typical required surface figure ranges from 1/4 to 2 waves @ 0.6328 μm. AR coatings for sapphire include BBAR for 3 to 5 μm. Many other specialized wavelength bands are possible within the 0.25- to 5.0-μm range. • Silicon is a semiconductor material commonly used in IR optical systems operating in the NIR and MW spectral bands. • With one of the lowest densities of the common IR materials, it is ideal for systems with weight constraints. • Is the lowest material cost option of all the IR materials but is more expensive to process than many of the other IR materials due to its hardness. Typical specifications for surface quality in the IR are 40-20 scratch-dig in the 1.2- to 3-μm region and 60-40 for 3 to 7 μm. Diamond-turned surface finishes of 50 Å rms or better are typical. The most common AR coating for Si is BBAR for 3 to 5 μm. Many other specialized wavelength bands are possible for the 1.2- to 7.0-μm range. Si can also be hard carbon or diamondlike carbon coated for 3 to 5 μm. • Optical-grade NaCl is water-soluble and transmits from the UV to the far-IR. Typical specifications of surface quality in the IR are 60-40, 80-50 or 120-80 scratch-dig. Moisture-protection AR and BBAR coatings are available for various wavelengths or wavelength ranges within NaCl’s transmission range. AR and BBAR coatings are available for various wavelengths or wavelength ranges within KRS-5’s transmission range. • As a chemical vapor deposited (CVD) material, ZnSe is the material of choice for optics used in high-power CO2 laser systems due to its low absorption at 10.6 μm. • ZnSe is also a popular choice in systems operating at various bands within its wide transmission range. • Its high resistance to thermal shock makes it the prime material for high-power CO2 laser systems. • ZnSe is only about two-thirds the hardness of ZnS multispectral grade, but the harder AR coatings serve to protect ZnSe. • ZnSe’s cost is about the same as ZnS Clear grade. Typical specifications for surface quality in the IR are 40-20 or 60-40 scratch-dig in the NIR and MW, and 60-40, 80-50 or 120-80 scratch-dig in the LW region. Diamond-turned surface finishes of 100 Å rms or better are typical. In the NIR and IR, typical required surface figures range from 1/4 to 2 waves @ 0.6328 μm. Typical available coatings include DLC for MWIR and LWIR, BBAR for the 0.8- to 2.5-, 3- to 5, 1- to 5-, 8- to 12-, and 3- to 12-μm spectral regions; and single-wavelength coating AR at 10.6 μm. Many other specialized wavelength bands are possible from 0.6 to 16 μm. • A form of CVD zinc sulfide that is further refined by a process that purifies the material and normalizes the crystal structure, which produces a homogenous single crystal-like transmission throughout the entire VIS, MW and LW spectral regions. • Due to its good transmission in the VIS and IR, Cleartran is an ideal choice for systems with a visible camera, and for various IR detectors or IR cameras. • Cleartan is about one-third harder than ZnSe. • Cleartran is about two-thirds the hardness of ZnS regular. • The relative price of Cleartran is about one-third more than ZnS regular; is about the same as ZnSe; and is generally more than Ge. Typical specifications for surface quality are 40-20 scratch-dig in the 0.4- to 3-μm spectral region and 60-40 or 80-50 scratch-dig in the 3- to 12-μm spectral region. Diamond-turned surface roughness of 100 Å rms or better is typical. In the VIS and NIR spectral regions, specified surface figure ranges from 1/10 to 1/2 wave @ 0.6328 μm. In the IR, typical required surface figure ranges from 1/2 to 2 waves @ 0.6328 μm. Typical available coatings include BBAR for the 0.8- to 2.5-, 3- to 5-, and 8- to 12-μm bands. Other specialized bands are possible from 0.4 to 12 μm. * Trade name of Rohm & Haas Advanced Materials (DOW). • As a CVD material, ZnS regular grade has good imaging quality from 8 to 12 μm. It also transmits in the 3- to 5-μm band, but with higher absorption and scatter than the Clear ZnS. • It exhibits high strength and hardness, and good resistance to hostile environments. • It is about one-third harder than Clear-tran and about twice as hard as ZnSe. Typical specifications for surface quality in the 3- to 12-μm spectral region are 60-40, 80-50 or 120-80 scratch-dig. In the IR, typical surface figure is specified from 1/4 to 2 waves @ 0.6328 μm. The most typical available coating specified for ZnS regular is BBAR for 8- to 12-μm regions. It can also be hard carbon or diamondlike carbon coated. Handbook of Optics, Second Edition, McGraw Hill, Inc. 1995. The Infrared Handbook, Revised Edition, William L. Wolfe & George J. Zissis, ERIM 1985. • With the employment of magnetorheological finishing (MRF) on many of the materials listed in this guide, tight surface figure such as 1⁄20 or 1⁄10 wave @ 0.6328 μm can be achieved reliably on spherical and aspheric surfaces, where it might not have been otherwise possible in the past with conventional manufacturing methods. • The achievable surface figure will depend largely on the material, aspect ratio of the optic, the ability to test the surface figure and the holding of the optic without distortion while testing. Aspect ratio: Diameter-to-thickness ratio. 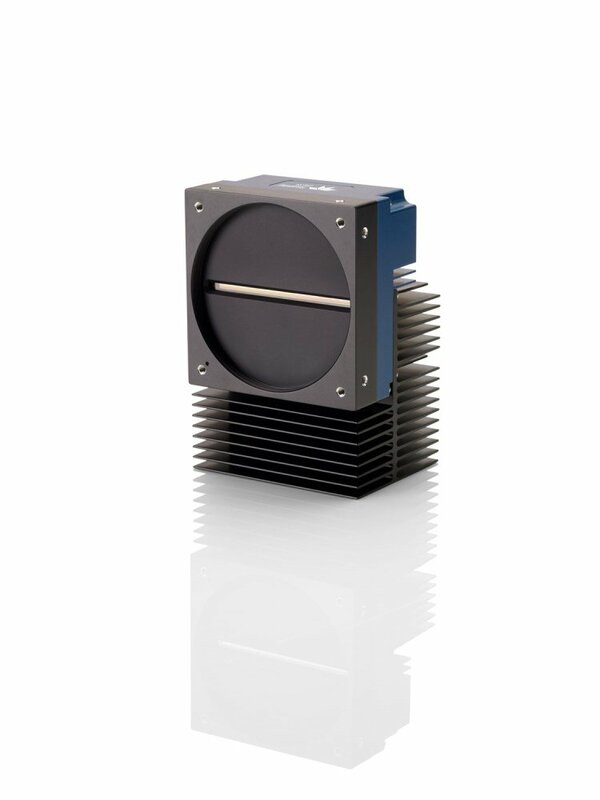 An optic with a high aspect ratio makes it difficult to achieve tight surface figure specifications and is more expensive. Scratch-dig: A surface finish specification applying to the polishing process, where the “scratch” refers to allowable scratch width on the polished surface in microns. A “dig” is a defect in the polished surface resulting from the polishing process and refers to the maximum allowable diameter of the imperfection in microns. The dig specification is also commonly applied to inclusions or impurities within a visibly transparent material, and coating imperfections. Diamond-turned surface finishes, however, are expressed as surface roughness in angstroms root mean squared (Å rms) rather than scratch-dig, because the single-point diamond-turning process does not produce the random scratches and digs that result from the polishing process. Surface figure: Commonly referred to as irregularity of the surface and usually expressed in fringes or waves at the test wavelength. In the optical design, careful consideration should be given when specifying the surface figure as it relates to the materials, wavelength of use, diameter, the aspect ratio and the geometry of the lens. UV: For the purposes of this discussion, wavelengths from 0.1 to 0.4 μm. (The ultraviolet region actually goes down to 0.001 μm). VIS: The visible region of the spectral band from 0.4 to 0.75 μm.